I was originally going to write about this together with The Know-It-All, but found myself talking about The Know-It-All so much that I thought it would be better as a single book post. 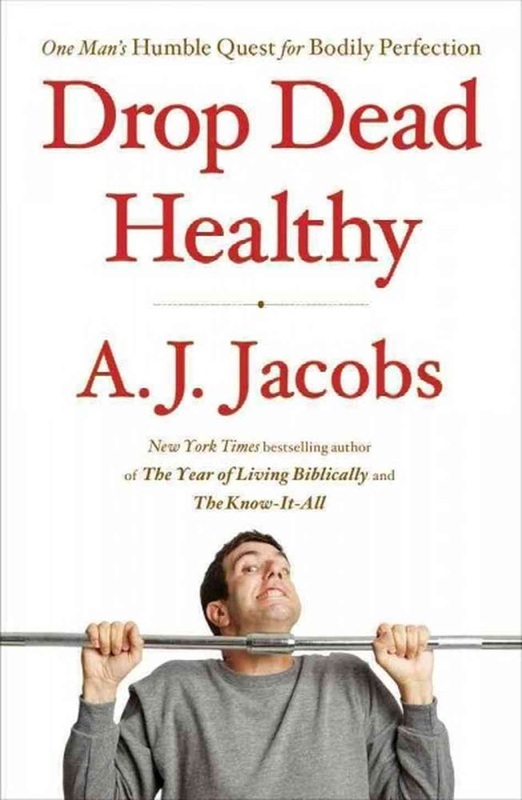 Drop Dead Healthy follows A. J. Jacobs as he sets about trying a lot of different health crazes and experiments in order to find the healthiest way to live. The thing about this book is that much as I enjoyed it, I don’t really have anything to say about it! The only thing that I took away from it really that I’m actually implementing is washing my hands more thoroughly, and spending time dreaming of a workplace that would allow me to have a treadmill desk (I HATE sitting down all day. I just end up feeling really uncomfortable after a few hours, and I could walk for hours without feeling uncomfortable). Yup. I don’t have anything to say really apart from that. It was enjoyable, and I found myself tearing up at it at times (one of the side stories is about his Granddad’s deteriorating health, and as my Granddad died last year I found myself way more affected than this than I normally would have done). So it’s not that I didn’t enjoy it! Not at all! If you’ve read any of his other things and enjoyed them, I’m sure you’d like this. I actually got The Know-It-All within about 10 minutes of finishing this (damn you kindle! Why must you make it so easy for me to buy stuff? ), so that goes to show how much I liked it. But yeah. Nothing else to say. So I won’t. This was a bit pointless really wasn’t it? Oh well! It’ll help me keep track of books that I’ve read which is one of the reasons why I’m writing this blog in the first place. They really do!!!! Hehe. I tend to wait to buy stuff on the kindle until I actually start reading it.. or at least that was the plan, but it isn't working that well. And even that way I have about 80 samples on there taunting me! Hehe. Though I would find such a book fascinating, I'm just too lazy to be actually inspired to make all those life changes, hahaha! I was inspired... but only for a week or so, and then I talked myself out of changing stuff :D Yay me! Hehe.